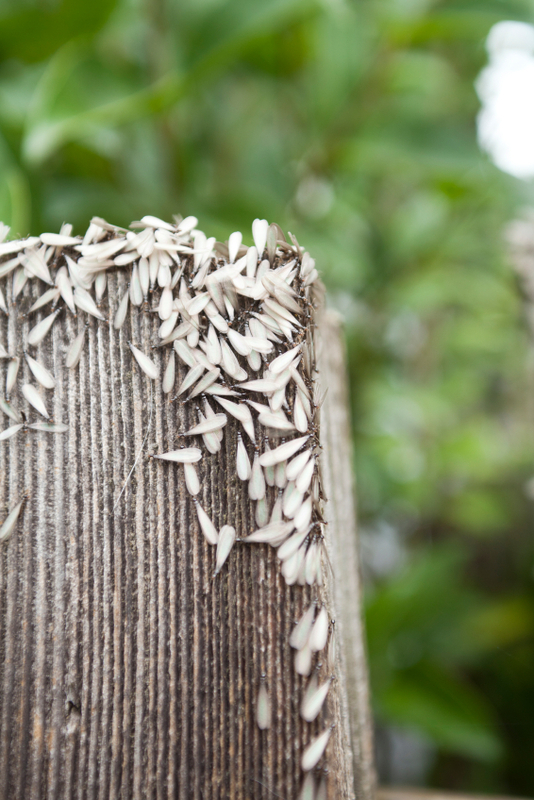 Most of the termites Americans are likely to encounter live in the earth near a ready source of wood, and thus they belong to a group of species called subterranean termites. However, many of these same species can and do perform aerial infestations and live in the wood itself. 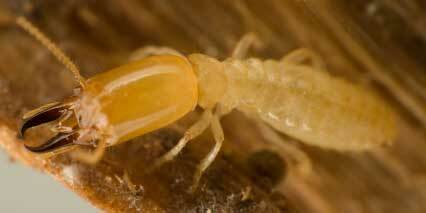 Species of this kind of termite have many characteristics in common. For example, they need water which they derive from the ground or from some source external to the wood. A leaking pipe, for example, can provide plenty of water and negate the need for a soil based nest. 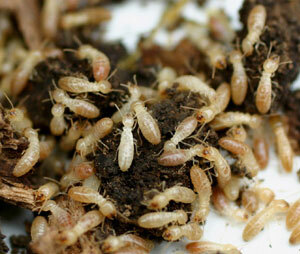 In most cases subterranean termites construct mud tunnels from the nest in the ground to the wood on which they feed. 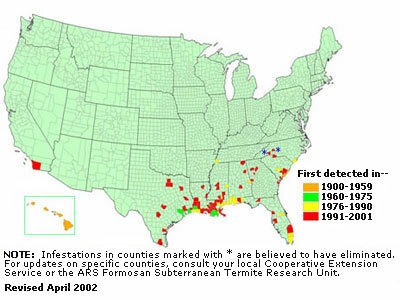 The appearance one or more mud tunnels are often the way to detect the presence of such termites. Through these tunnels the worker termites, often called white termites, come and go between the nest and the wood. They chew on the wood and in their stomachs the protazoa, single celled creatures living there, will digest the wood to provide a number of nutrients. Notable are the sugars from which cellulose has been synthesized in the growing tree. These sugars are as nutritious to the termite as the starch in bread is to humans. When the worker’s gut if full of digested wood, it will run through the tunnel back to the nest. There the worker might regurgitate the food for the benefit of the reproductive pair that produce the eggs from which grows an ever increasing population. Or, the food may be used for the benefit of developing larvae, for feeding the soldiers, or for other growing workers. 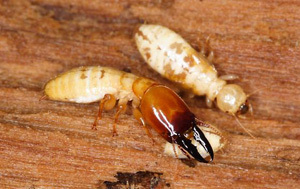 The busy worker termite will have enough energy left to run (you never see a termite strolling) back to the wood supply where many, many other workers are chewing off portions of the piece of wood they are making more or less hollow. As you may suppose, this worker termite was once an egg, then a larvae, then a growing nymph. Somewhere in its development the worker stopped being fed and started being a feeder. It may live several years as a worker, contributing to the welfare of the many other members of the colony. Of course, a subterranean colony of termites may have thousands to millions of these workers, each with a lot of ambition and purpose. They will keep working day and night, with no vacations, holidays or weekends. 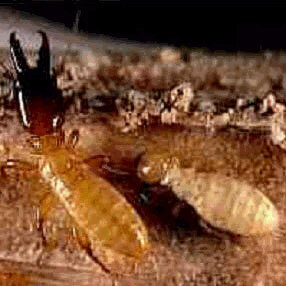 These worker termites came, as we said, from eggs laid by a female reproducing termite who we might as well call Queen. The eggs have to be fertilized, so there has to be a King. On one glorious day in the past the Queen and the King flew off from their home nest in the midst of a swarm of similar couples. The two of them landed close together and lost their wings before starting their own colony. At first, a new Queen and King have just a few eggs which they take care of themselves. For maybe a couple of years they will be almost unnoticed and unnoticeable. Most of the termites coming from their eggs will become workers who, when they are big enough will start their working careers. A few of the eggs will turn out to be soldiers who will protect the Queen, the King and the workers from roaming ants and other predators. When the colony is sufficiently large some of the eggs will develop into winged flying termites, called alates, males and females capable of mating and producing eggs. If the Queen and/or King of a colony perish for any reason, some of these new alates will take their place. Usually, the new alates will decide it is time to start a home of their own and will fly away in swarms to start new colonies wherever they happen to land. Of course they had better land near some good chewy wood, because that is what they will need for nourishment. They also had better land near some source of moisture, such as damp ground or a leaky pipe. Subterranean termites with their advanced social order have been working out their system of living for millions of years. Depending on the age and state of development a given colony may be thousands, hundreds of thousands, or millions. Everyone works, and when one passes away, there is another to take his or her place. A close up view of a subterranean termite soldier. PreviousWhat Do Termites Look Like?